Dear email subscribers (God bless ya! )—for the time being, please click through the blue post link to access full posts direct from the blog–as you may know the email subscription service is cutting off the post for some reason. That is why you only see a few lines, and no photos are visible in the email. I am trying to fix it, but it may take til next month when I sit down with a smart web consultant to help me. Thanks for your patience. And while I’m at it, I might as well throw up another photo, this one from my most recent Ohio trip. 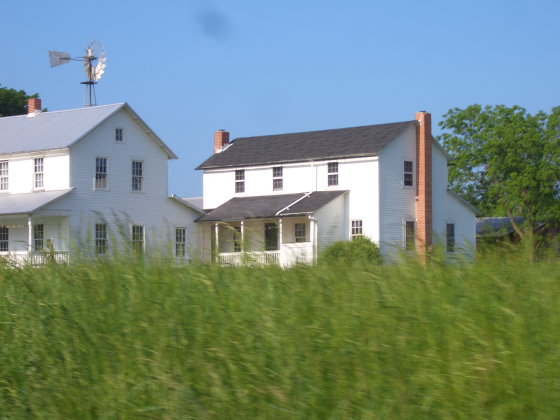 This is a Swartzentruber Amish farm in Wayne County. Wish I was there! I can feel the cool breeze. Thanks for sharing! enjoying the photos – I’m curious, do you shoot out of a car window, or stop and carefully pick your spot. Do you try to avoid being seen taking photos? This is a well kept farm. Glad you enjoy the photos–and Andy good question, I stop or am going at tortoise speed, say behind a buggy. It helps that Holmes County has many places to pull over and on back roads very little traffic. My shots are usually landscapes or buildings or buggies from a distance, though I don’t flash the camera around too much. I love your blog and find it no hardship to click on the link. Thank you for looking in to fixing that if you have the time. I really enjoy reading about your visits and venturing about. Thank you for the photos you share that allow us mini vacations from our busy days. It’s like a sigh of summer breeze some days. hi, you did not reply to my last e-mail ???? my question was, why dose an amish preacher , is allowed to come into a family’s house, and go thru there dresser drawers and cabinets looking for counterband ?